Data released last week for Maryland’s new high school assessments set a new baseline that will help to determine if students are on track to graduate ready for college or careers. 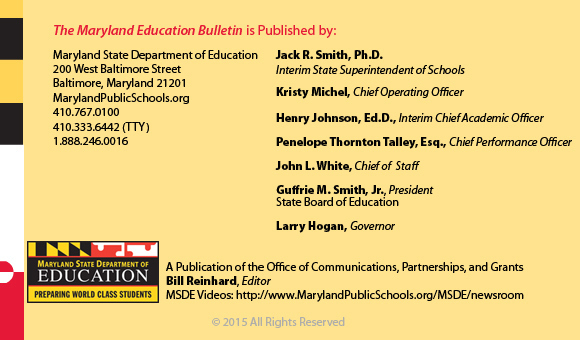 The data were presented to the Maryland State Board of Education. Nearly 40 percent of high school students taking the PARCC English 10 assessment last spring scored at a Level 4 and 5 combined – the two highest levels on the PARCC five-point score scale. More than 30 percent of high school students attained Level 4 and 5 combined in algebra I. For high school, achieving Level 4 or 5 indicates readiness for college and is intended to help students avoid the need to take additional coursework before taking credit-bearing courses beyond high school. The scores required to meet these thresholds were determined over the summer by Maryland educators and their peers around the country. Local system and school results will be released online this week. Also released last week was the statewide data for Maryland’s first-ever algebra II test. More than 20 percent of students scored at a Level 4 and 5, combined, on that test. PARCC results cannot be compared with the Maryland School Assessment (MSA), which the State used for a decade, both because this is a new test and a different test. PARCC is the first assessment aligned to Maryland’s College and Career Ready Standards, which set a higher bar for student learning. The tests go beyond the old “fill in the blank” model of standardized tests by emphasizing the need for students to demonstrate critical thinking, problem solving, and clear writing. These tests also will show growth in student achievement over time. For example, parents and teachers will better be able to determine if students taking the math and reading assessments in third grade are progressing in their understanding of the subject matter when they reach fourth grade and beyond. The MSA results were based on the previous academic standards, which have not been in use since 2013-14, or earlier. The MSA had just three performance levels and were set at a less rigorous target. The result: most students were considered proficient in the subject matter when Maryland adopted the plan for higher standards and more advanced assessment in 2010. This pattern of raising standards and creating new assessments has been in place in Maryland since the 1980s. 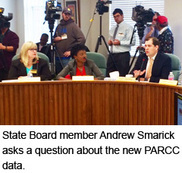 Future PARCC test results will be available sooner as more students are assessed online. More than 82 percent of students took online assessments during the first administration. Paper-pencil assessments are available as needed in the first three years. Complete data will be available on November 5 at MdReportCard.org. 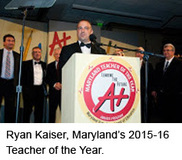 Ryan Kaiser, a sixth and eighth grade social studies teacher at The Mount Washington School in Baltimore City, last month was named the 2015-16 Maryland Teacher of the Year. Interim State Superintendent of Schools Jack R. Smith made the announcement during a 25th Anniversary Teacher of the Year Gala in a ballroom filled with educators and dignitaries. Among those in attendance were U.S. Representatives Donna Edwards, Steny Hoyer, John Sarbanes, and Chris Van Hollen; Comptroller Peter Franchot; and Keiffer Mitchell, special advisor to Governor Larry Hogan. Governor Larry Hogan and Lt. Governor Boyd Rutherford congratulated Maryland’s newest Teacher of the Year. An education graduate from the University of Nebraska, Kaiser also received a master’s in elementary administration from the university. He has been a teacher for 16 years, the last 10 in Baltimore. Kaiser serves at the school’s coach for the Baltimore Urban Debate League, is a mentor teacher, and is a member of The Mount Washington School Parent Teacher Organization. Outside the classroom, Kaiser serves as the communications coordinator for the Maryland Council of Social Studies and writes curriculum and lesson plans for teachers nationwide for the White House Visitor’s Center. Kaiser comes from a family of teachers; his grandmother taught elementary school and both of his parents were teachers and educational administrators. He fell in love with history as a child, and said it was “almost a given” that he’d become a teacher and provide his students with the type of experiential learning that makes a lasting connection. Selecting Kaiser for the award was not easy for the judges. The other outstanding finalists were: Dr. Stephanie Marchbank, Allegany County; Jennie Merrill, Anne Arundel County; Amanda Porter, Frederick County, Stephanie Geddie, Howard County; Barbara Sutherland, Queen Anne’s County; and Sally Irwin, Washington County. The Maryland Teacher of the Year goes on to compete for the esteemed National Teacher of the Year Award, to be announced next April. Maryland has had a history of national success with its Teacher of the Year Program. Three Maryland teachers have received the National Teacher of the Year award since 2006. One of the most effective ways to improve learning is to make certain all Maryland students Maryland have access to great teachers and principals. That is the goal of our statewide Teacher and Principal Evaluation (TPE) program, which is beginning to produce data that local school systems may be able to put to good use. While overall ratings for educators remain high, differences in the percentage of effective educators are emerging between schools and school systems. The data, unveiled last week before the Maryland State Board of Education, is based on the 2014-15 school year. It found that 44.55 percent of teachers were rated “highly effective,” the top tier of the three part rating system. Likewise, 47.1 percent of principals were rated “highly effective,” under the evaluation system. Maryland school systems have spent the past five years developing TPE programs. Every Maryland school has begun to see the benefits from the professional development and collaboration used to develop Student Learning Objectives (SLOs) to guide instruction. Systems are currently in the third year of implementing new evaluation systems, and MSDE will continue to monitor progress in that implementation. The new data release marks the second annual statewide effort to evaluate teacher and principal effectiveness based in part on student growth. Each school district could develop its own evaluation system within State parameters, or could use a State-developed system. In the end, each district constructed an evaluation model based on its own interests, and each local superintendent and head of the local bargaining unit signed off on the design. All 24 of Maryland’s school systems are now participating in the Statewide Teacher and Principal Evaluation Program. "Read our full report," Analysis of 2014-15 Teacher and Principal Effectiveness Ratings. Maryland First Lady Yumi Hogan last month put a welcome spotlight on student art. The First Lady honored some of our State’s top student artists during a special reception in Annapolis. The students are among those whose art is currently being displayed in a special exhibition in the House of Delegates Gallery Space. Elementary School - Jasmine Diaz, a second grade student at Vansville Elementary School in Prince George’s County. Middle School - Mackenzie Clark, a sixth grade student from Kent County Middle School in Kent County. High School - Taylor Williams, a senior at Huntington High School in Calvert County. The student artists are among those from more than 20 school systems whose art is part of the First Lady’s Inaugural Student Art Exhibition. The First Lady, an adjunct professor at Maryland Institute College of Art and an accomplished artist, has been an active supporter of the arts community and advocate for arts programs in schools across Maryland. The exhibition is supported by the Maryland State Department of Education’s Fine Arts Office and the Maryland State Arts Council. MBRT members talk about the importance of Raising the Bar of academic excellence for Maryland students. Patterson Park Public Charter School celebrates it's 10th year of operation. The school was among the first to open under Maryland's charter law. Maryland wins an award from the World Future Council for its work in establishing an environmental curriculum.